This bathroom makeover is the second makeover this small hall bath has gotten since we moved in 2.5 years ago. I can honestly say that in that 2.5 years, my style has changed. Thankfully, Matt puts up with my changing styles and for the most part is a good sport about helping me redo a space. After we moved in, this bathroom was a blank canvas. So, what did I do with that blank canvas? I added thicker trim than my baseboard trim to the middle of the wall, and to the mirror. 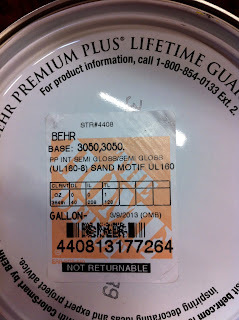 Then I topped it off with this terrible paint color that I mixed myself. This poor bathroom stayed this way for 2 years. Luckily, a year ago, I found a website called Pinterest. 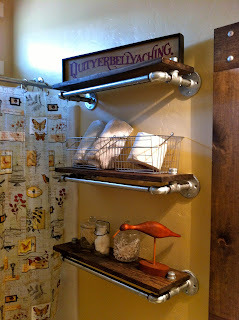 If you follow me on Pinterest, you know that lately I have been lovin' me some industrial style stuff, mainly shelving. Matt added 3" hook board to the top of the wall. He also added trim around the small window. He then caulked the trim to fill in the gaps. I patched, sanded, primed, and painted the walls and trim. 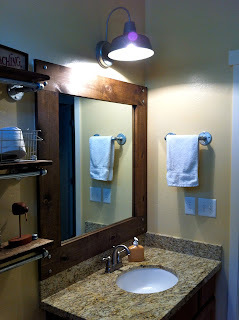 We installed a new light ($40 at Lowe's) and framed around the mirror again, but this time we used wood. 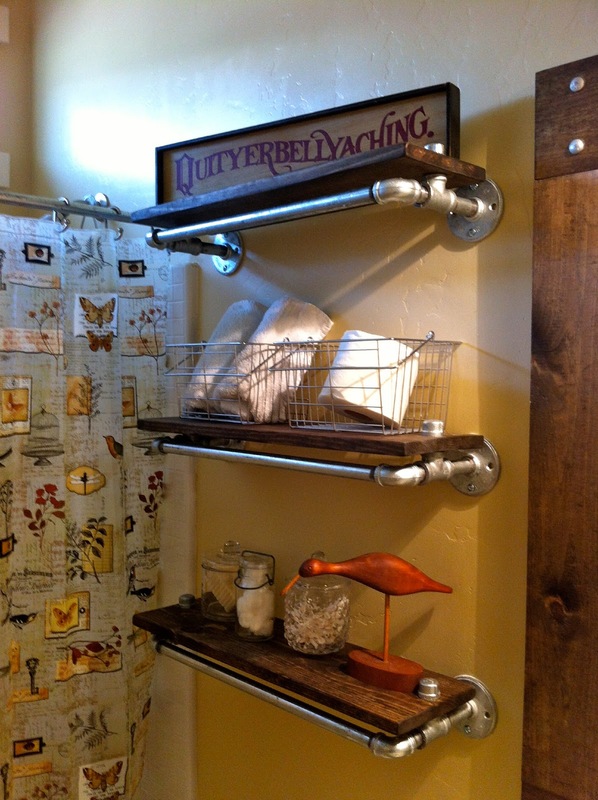 Matt built some awesome industrial style shelves. 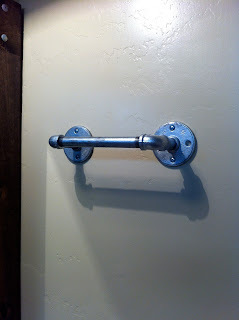 Matt made and installed a new shower curtain rod. 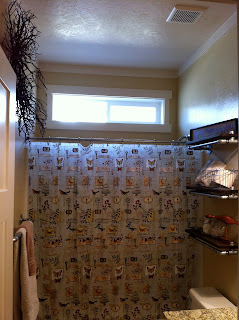 For this new curtain rod, I bought a new shower curtain ($10 at Walmart), and decorated the shelves. 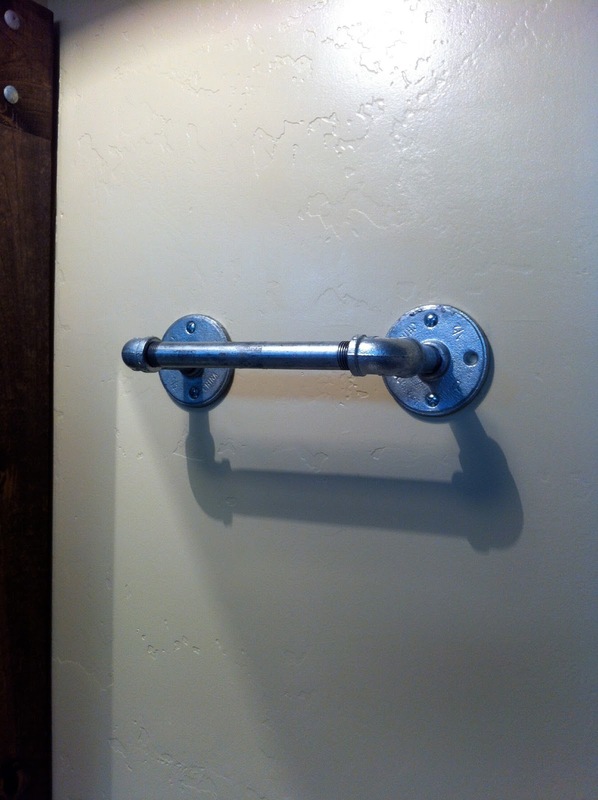 Matt put together and installed an industrial style towel rack. I love how this bathroom makeover part II turned out. So much better than the first time around. 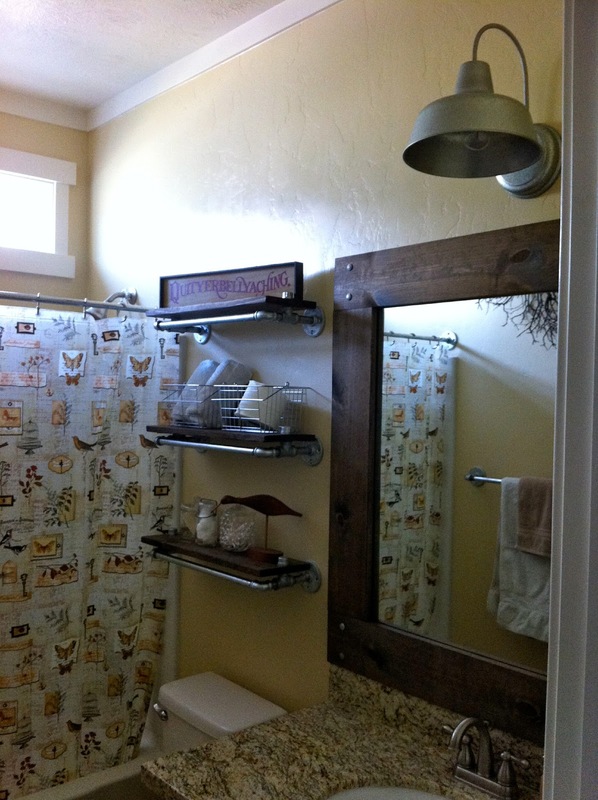 Stay tuned in the next couple of days for tutorials on the shelving, towel racks, and mirror framing. You won't want to miss it! Amazing! I want to follow you on Pintrest. How do I do that? I'm new to the site. I love it!! It looks so cool. The mirror and shelving is my favorite part. How do I apply for a home-makeover by team Matt and Jessica? I love the light you got at Lowes I could not find it at my Lowes can you give me more info or a SKU number to order it,Please.